I visited the shop to purchase a few gifts. I found what I was looking for on my own. I must say when I approached the till I was not greeted with a "hello". The two young ladies were busy chatting about the weekend to notice me. The only interaction I has with the till staff was " do you wanna bag". To the question I responded with " no thank you". I looked up for a smile or a thank you in return. However both till staff stood looking cold at me, I left feeling quite angry. I never have took the time to give feedback online to stores as I often think we as customers are a little voice. However on this occasion I felt the need to let your store know that the staff are lacking customer service. A thank you will go along way. Cashier JR served me. At this visit I was returning a bag which was faulty. The very friendly and efficient attitude of your staff was wonderful. Good quality shoes, very good price, nice bright, clean store and helpful staff. Great! 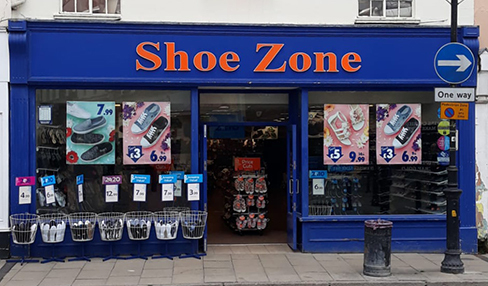 I went to Braintree shoezone I brought a pair of boots for £16.99 13/10/14 when I walked about in them at home I noticed they were tight as I am 8mths pregnant I didn't want to fill uncomfortable so I went back to the store they didn't have anything bigger so I decided to get a pair of £19.99 pair instead I went in there first time on the 14/10/14 when I showed her the boots I wanted too change she rudely said I'd worn them out and they wasn't giving me the money back so I walked out very upset, the next day 15/10/14 I walked back in there and said the same thing the lady rudely said about the policy I told her I have read the policy and I haven't even worn these boots yet and i can't wear them she in the end let me swop after I put my foot down knowing my rights, I shop alot in there for me and my kids and it was the first time i ever returned anything this will be the last time I ever shop in any shoezone as your staff was very rude and left me very upset!